My paintings are often large, and their colours dull, greyish. 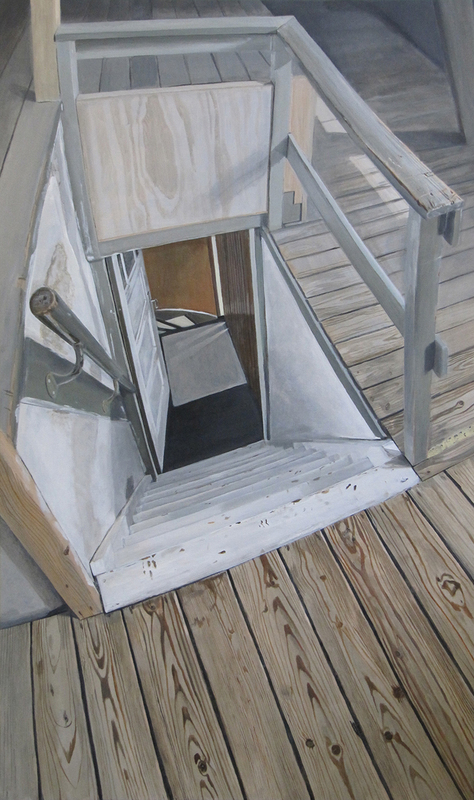 They show the view or a corridor of my everyday surroundings, and are painted on location from observation. The subjective perspective intensifies spaciousness. Thus, the viewer becomes the human in the painting. What are you doing here? 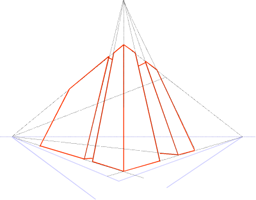 Linear perspective is based on a single eye with a fixed viewing angle. It is a system with three vanishing points with straight lines running towards them. It is relatively easy to learn and (therefore) often used. Curvilinear perspective recognizes that horizontal and vertical lines have a curve, as a result of a changing viewing angle. For example, the line between the ceiling and the wall in front of you bends towards the horizon, both at the left and at he right. Curvilinear perspective is a far more complex system which results in a better spatial experience. Using a computer to do all the calculations is handy. Subjective perspective - my own terminology - is more like curvilinear perspective than linear perspective. The systematic part is released in the sense that there are no fixed calculation rules. Basis is the subjective experience of space. Space is experienced by looking around with both your eyes. Therefor lineair perspective - with a fixed angle of view - is no good. Not curvilinear perspective calculation, but subjective experience determines the curves. Imagine a window post between two windows in a straight wall in front of you. Looking through the left window, the window post will bend to the left at bottom and top, looking through the right window it will bend to the right at bottom and top. Thus conflicting situations occur in which a line simultaneously has to bend towards both left and right, or both upwards and downwards. Of course, this cannot be drawn as such. Arbitrarily choices have to be made, with subjective experience leading in the process of determining what angle of view is (locally) dominant. Besides, one should compensate for viewing the canvas itself from different angles, and perspective shortening on canvas. The larger the canvas, the more difficult, but also the larger the opportunity to generate a spatial feeling. Really experiencing space by looking at a painting is impossible, but I keep trying to create spaciousness as good as possible. 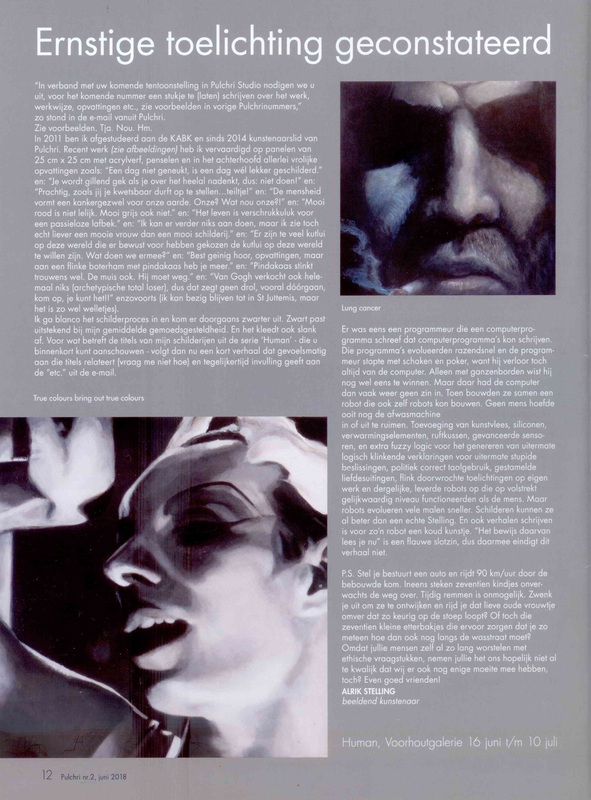 To illustrate this one of my paintings is shown below. It measures 2.00m x 1.20 m. Viewing this painting on a small computer screen, the spatial experience will be limited, and the picture itself will look quite distorted. If one stands in front of it at close distance and 'feels' the space - e.g. becomes slightly dizzy and wants to reach for the banister at the right - then the subjective perspective has succeeded. At that moment the viewer has become the human in the painting. No people are seen in the Elsewhere series, on purpose. The Human series - as a counteractive investigation - explicitely depicts people, partly hidden. This series is developed associatively. 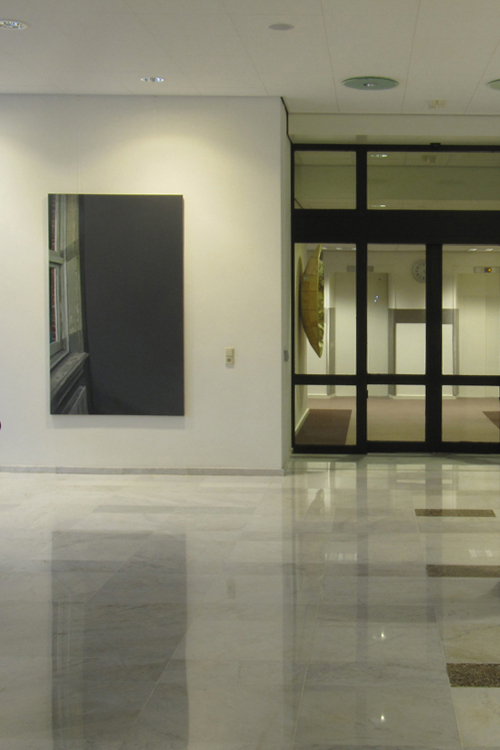 Member of Pulchri Studio, The Hague (per 1 april 2014). Two Elsewhere paintings have been created at Pulchri Studio during public live painting sessions. A short movie has been made of my Artist at Work project. In 2014 and 2015 public painting/drawing demos during Museum Night, at Pulchri Studio. Work has been acquired by private individuals, health insurance company Menzis, and the Ministry of Foreign Affairs (to be placed in the Dutch embassy in Havanna, Cuba). This website has been developed by myself. All rights reserved. Pulchri studio, 2018 - opening solo-exhibition Human: Aren't we all tragic clowns? Group. Sommerurlaub, Grüße aus.... Bergischen Kunstgenossenschaft e.V., Wuppertal, Germany. 20 jan-17 feb 2019. Group. Najaarssalon 2018. Pulchri Studio, The Hague. 22 sep-14 oct 2018. Solo. Human. 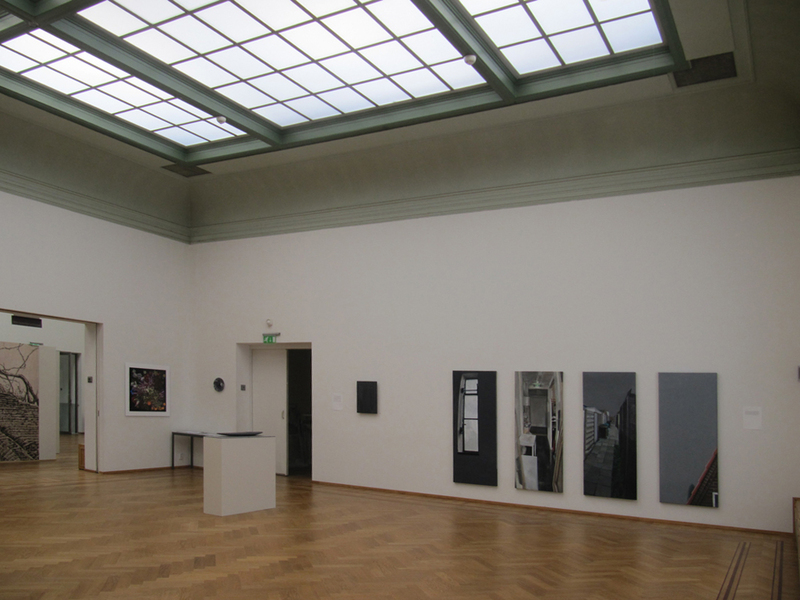 Pulchri Studio, Den Haag. 16 jun-10 jul 2018. Group. Sta-Art galerie, Alphen aan den Rijn. 18 mei-22 jun 2018. Group. Stadsgezichten. Galerie ZoFier, Workum. 17 nov-31 dec 2017. Group. Kunstroute AlphenArt. Alphen aan den Rijn. 03 nov-05 nov 2017. Group. Najaarssalon 2017. Pulchri Studio, The Hague. 09 sep-01 okt 2017. Group. Voorjaarssalon 2017. Pulchri Studio, The Hague. 22 apr-14 mei 2017. Group. Najaarssalon 2016. Pulchri Studio, The Hague. 1 oct-23 oct 2016. Group. Pulchri in Bronovo. Bronovo hospital, The Hague. 22 juni-oct 2016. My works have been removed early after complaints. Group. Voorjaarssalon 2016. Pulchri Studio, The Hague. 09 apr-01 may 2016. Group. Winterschilder. Pulchri Studio, The Hague. 19 dec 2015-10 jan 2016. Group. Najaarssalon 2015. Pulchri Studio, The Hague. 26 sep-18 oct 2015. Group. Voorjaarssalon 2015. Pulchri Studio, The Hague. 02 may-25 may 2015. Group. Pulchri Abstract '15. Pulchri Studio, The Hague. 07 mar-29 mar 2015. Group. 10 jaar Wit. Galerie Wit, Wageningen. 10 oct-16 nov 2014. Group. Najaarssalon. Pulchri Studio, The Hague. 06 sep-28 sep 2014. Group. Verse aanwas. Pulchri Studio, The Hague. 09 aug-31 aug 2014. Group. Voorjaarssalon 2014. Pulchri Studio, The Hague. 19 apr-11 may 2014. Group. Nieuw Talent 2013. Realisme Amsterdam (art fair). Gallery ArtOlive. 17-20 jan 2013. Solo. ZonMw, The Hague. 09 oct 2012-jan 2013. Solo. SER, Den Haag. 30 jan-09 mar 2012. Group. Menzis Jong Talent 2011. Azivo head office, The Hague. 01 oct-31 oct 2011. Group. Friday Night Event. Van Gogh Museum, Amsterdam. 28 may 2010. Interactive computer animation (AR Lab project). Email adresses differ from each other!